Later topic: WIKIPEDIA, or 'Would you like to buy a bridge? Earlier topic: Want brand new foundry type? 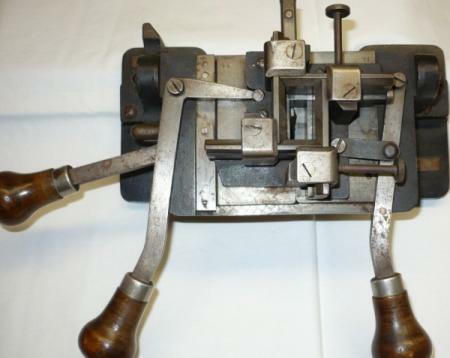 It’s a Typofix Typecaster, a small apparatus used to copy existing type, either metal or wood. 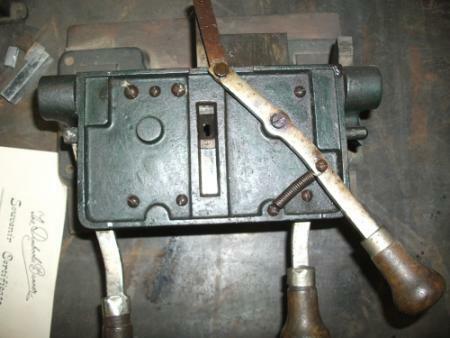 First, a mould is produced, then the hinging part is flipped over, and a sort can be cast. I’ve got some instructions and will try to attach them. I can send you a better quality TIFF file if you want. 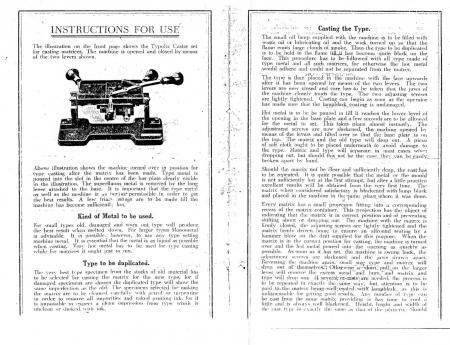 The instruction sheet for the Typofix that Thomas kindly posted sems to be the same as the one available on the “metaltype.co.uk” website as a PDF. I would guess that his TIFF images are probably higher resolution, though. 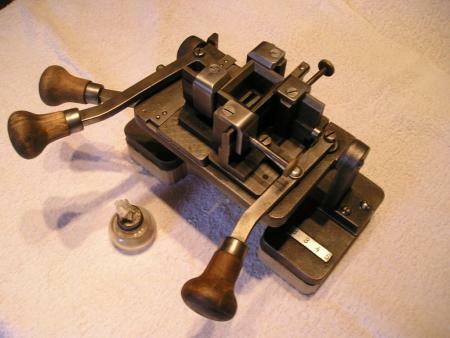 The surprising part of these two devices is that you use them to produce a temporary matrix made of typemetal from a piece of existing type (also typemetal, of course) and then cast from it type (of typemetal). You wouldn’t think that this would work, but it does. 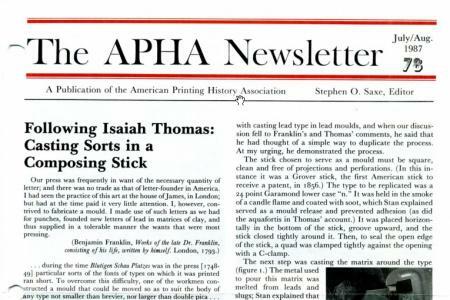 Thanks for your posts, I am learning interesting history of things about printing that I had not previously learned. I folded a printer’s hat, not often seen outside U.S.A., but found that it needs an A2 sheet of paper (2 newspaper broadsheet pages). I am so impressed with this little unit. I am trying to track one down, but it would appear they are quite rare in Australia. Thomas if you can email me a larger image I would be very grateful. I have been lucky enough to have one of these units on loan and have just started to come to grips with it - its not as easy as it seemed at first. It would appear the heat of the metal is crucial in getting the type metal to flow into the original. Coating the surface of the type with candle soot is also a bit of an issue. The brochure mentions a specially supplied burner to do this but I’ve been burning plastic sprue , which seems to be laying down a thicker coating that I reckon I need. Once the mold is made this too must be coated in soot. The last stage of pouring metal into the mold to create a new piece of type is the hardest.The opening is very small and one needs to be pouring with one hand while using the jet cut-off lever with the other. Failure to cut off the jet at this stage inevitable leads to a jammed unit as there is too much metal above and below the pouring slot. I have attached a photo of the various bits that are created with the Typofix. Sorry for the quality as I don’t have a macro on my camera. 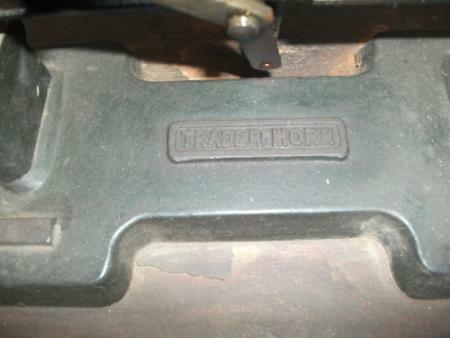 You can see in the photo the original piece of type, the mold and the new piece of type cast from the mold. I’ll get hold of a better camera and post some better images soon. I appears as thought type smaller than about 18pt could not successfully be cast. I managed to get a good reproduction of a corner device in 48pt. aswell as some fair copies of 36pt uncials. At this stage I am using old Lino slugs and scraps so a better metal should produce better results. 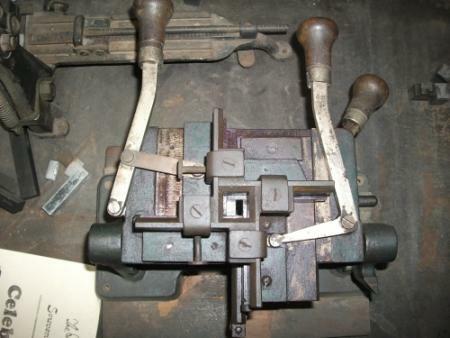 I am also begining to think that for casting a new font it would be better to make the mold out of another, higher definition casting material than type metal, or better still have a set of brass matrices engraved . Although the brochure claims one can cast from wooden type I have not had any luck at this stage getting a good mold from my wooden type. If anyone has used one of these in the past I would welcome any hints or comments. An alcohol lamp might work for smudging the mold; or a candle, better than toxic plastic. Lino metal has a different melting point from foundry metal. and is cast under pressure. What you are attempting is more like hand-casting, by gravity, so metal composition and appropriate temperature are the most important factors, and assume that hand-casting should be the reference point. Ihad one of these, couldn’t figure it out, I tried casting some old flongs with not much success. I would think you would have to heat it up a little or you will get a cold face. Made a few good blanks with it. Donated it to the museum a few years ago. Try a thin dusting of baby powder over the first ‘copy’ cast, it may assist the flow of metal. I’ve really got to try this someday, just for the fun of it. 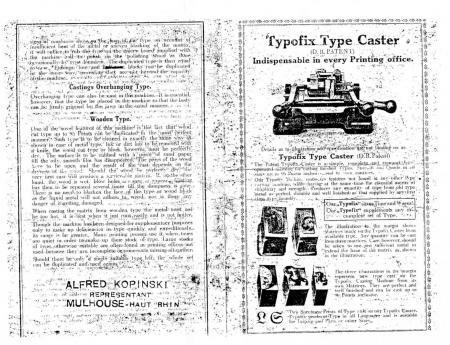 I have a Typofix Type Caster for sale. The information pamphlet was supplied to Metaltype.co.uk by myself years ago. I am situated in Edinburgh, Scotland and was the service engineer for Monotype Corporation from 1966 to 1977. My phone number is 0131 556 6299 and my email address is [email protected]. What do you want to pay for my machine….???? As little as possible, of course. :) I’m always broke these days but send me a price to my email and I’ll see if it’s even do-able for me. Thanks! I really have no idea what a fair price would be for one of these. Does anybody know what they go for in today’s market? What material is used for making the molds for this thing? 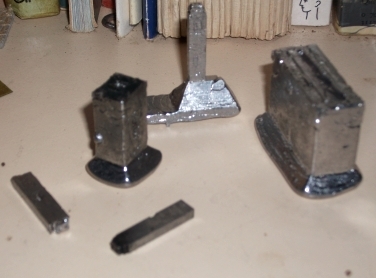 smokeynewton: you cast a mould in lead and use that lead mould to cast a duplicate glyph. thomas gravemaker: What prevents one from melting the other? What happens when you pour liquid water into a glass full of ice? The ice doesn’t instantly melt. Often times, it fuses together. The reason is that the ice is cold enough to flash freeze the water touching it. The same happens here. The solid typemetal is cold enough to flash freeze the molten typemetal poured onto it. You coat the mold in soot to keep the two from fusing, just as the ice would. I’ve got a copy of the original instructions that came with the Typofix. The machine came with a burner/lamp that would create a film of soot on the glyph that had to be duplicated. This film prevented the molten lead to adhere to the thus created ‘mould’. I will sell my machine. if someone interested please contact me.